Who You Gonna Call This Halloween? In the Fall, when the dust comes off your copy of Sleepy Hollow and you begin to crave Halloween adventures, the Buck Eye State stands out as a hotbed of paranormal activity! In fact, there’s an urban legend that Ohio has its own haunted hospital attraction, so scary that no one has ever made it all the way through. This is false, but here’s the truth for R.N.s looking to ghost hunt: there are plenty of real haunted hospitals for those in Ohio travel nursing jobs—you just need a reliable treat—cheat!—sheet! Area C of The Heather Hills Hospital in Chardon: Every R.N. hears her share of patient complaints, but none so interesting as the ones lodged here. Are they really complaining about “knicker boy” (boy ghost in old-fashioned pants) again? Why not come to Chardon, Ohio—home of the Geauga County Maple Festival—and find out! Athens Ridges: The Ultimate Spooky Collegiate Tour! Ever visit Athens Ridges, part of the Ohio University Campus? You’ll find more than autumn leaves; this former insane asylum closed its doors in 1980 after a girl, a patient there, disappeared and was later found dead. The tour guide will explain everything. Columbus, Ohio is the state’s biggest city, with many draws…and ghosts! The Children’s Hospital in this fair city was purportedly built on top of an old cemetery, and patients there claim to feel that someone—not the night nurse—is watching them at night; hospital staff also report unseemly things moving in the shadows. The Dayton Heart Hospital Will Have Your’s Pounding Madly: Located in what is nicknamed the “Gem City” of Dayton, Ohio, travel nurses in this town are also within minutes of Cincinnati’s incredible dining and shopping. In Dayton’s haunted hospital, people walk through strange cold spots, and see elevator doors opening and closing arbitrarily. The Hospice center there is rumored to have the ghosts of children haunting it. Travel Nurses Will Love Toledo for Its French Heritage…and Haunts! This city is the most populous in the state, and therefore draws many healthcare professionals for its sheer number of high paying nursing jobs. It helps that there’s plenty to see and do in the downtown district, where greats like Art Tatum learned to tickle the ivories. For haunts, check out The State Hospital in Toledo; it’s rife with reports of moans and groans from the unearthly, and unexplained dark shadows flickering across the walls. Don’t miss your chance to take a nursing job in a state that has given us great jazz, writers and last but not least, EIGHT U.S. Presidents! For those RNs who prefer a more subdued Halloween, Ohio nursing jobs can still help you finish the year with a bang and not a whimper. When you call 1-800-996-2206 or apply online, you can talk to a consultant in just enough time to leaf-peep or enjoy the Christmas season in one of America’s most beloved states. They didn’t put the Rock and Roll Hall of Fame or the world’s tallest, fastest roller coaster here for nothing! Happy trick or treating everyone! 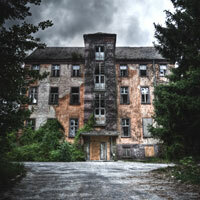 Footnote: Travel nurses interested in a complete list of Ohio haunted hospitals are encouraged to click the link! Next Next post: Are You a Travel Nurse Who Caught the Cooking Bug? This is great! I have worked nurse travel jobs for years and love it. This year for Halloween I was in LA. Great haunted houses!